No, but we do occasionally order x-rays, MRI, CT and other advanced imaging and refer out for as needed. 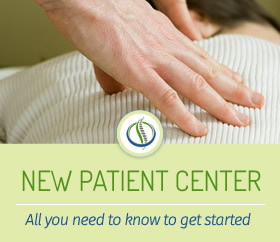 Learn more about what to expect at your first visit. We advise you to follow the 24 hour rule – Within 24 hours after injury or swelling, use ice for 10 minutes per hour; if past 24 hours you should usually use heat for 20 minutes per hour, which will feel better on muscles. But you can always call and verify (we’ll do our best to get you an answer quickly). Can you just squeeze me in for quick adjustment? While we do our very best to squeeze as many Care visits in as possible, we never want patients to feel herded like cattle. We strive for each and every patient feeling cared for by receiving a thorough evaluation and treatment, so if one of our front desk Team members can’t “squeeze you in” it is because they are doing their very best to balance everyone’s care. It depends on how complex case is, what doctor finds, and determines is necessary. We are participating providers for most insurance plans. I’d rather be billed. Can I utilize insurance before I pay? You can always utilize your insurance, but if/when we know what your portion due will be, we ask you to pay your portion at the time services are rendered. Often times that’s right away. This helps us reduce time, effort, envelopes, paper and postage, which means more time focused on your Care at Chiropractic CareCentre. Medicare covers 80% of necessary adjustments and treatments, but NOT an examination, therapies, x-rays, maintenance care or extra-spinal/extremity adjustments. Why do you require a credit card to hold a Massage appointment, or bill me if I’m no-show or do not provide a 24 hour cancellation? Massage appointments are often quite lengthy and time slots would/could be filled while our massage therapist has availability, keeping scheduled appointments is extremely important and therefore CC policy is in effect. Are the nutritional supplements expensive? We carry only the highest quality supplements that have met independent quality assurance standards. Many “big box and discount pharmacy” supplements are being “found out” to not have what they claim is in the bottle. To even go a step further, we recommend patients see our Nutritional Consultant to customize their care plan with specific and targeted nutrients to optimize health and get the best “bang for their buck”.